I made it back from vacation in sunny, humid South Carolina (Charleston and Folly Beach). I can’t believe how much we did in only four days. But it was a fun trip! I even picked up some local raw, organic honey. And the cutest honey pot. Win! So, I come home to the best summer weather in the world – cool and rainy. I’m not much of a summer gal (yes, I just got back from a beach vacation, but that doesn’t mean it’s my preferred weather). And after a week of seafood (my own attempts at bacon-wrapped, crab-stuffed shrimp will be forth-coming), I was ready for some fall food – SOUP! I had hamburger and a few Italian sausage links in the freezer, so I set them out to thaw. 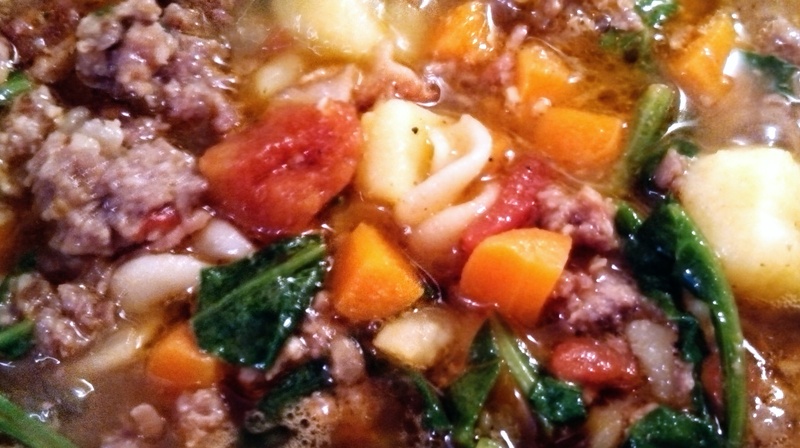 Then started searching for soup recipes with Italian sausage and hamburger, and kept coming up with minestrone soup recipes, which I don’t love. But after looking at them, realized I could probably make something I DO like by taking out the things I don’t (beans, tomato based broth, and I don’t care for zucchini in soup, no matter how little I cook it, I don’t like the consistency), and amping up the things I do (MEAT!, broth, onions and garlic). About a month ago I bought my first portion of a cow. An 1/8th of a cow, to be exact, but I bought 25 extra pounds of ground beef. 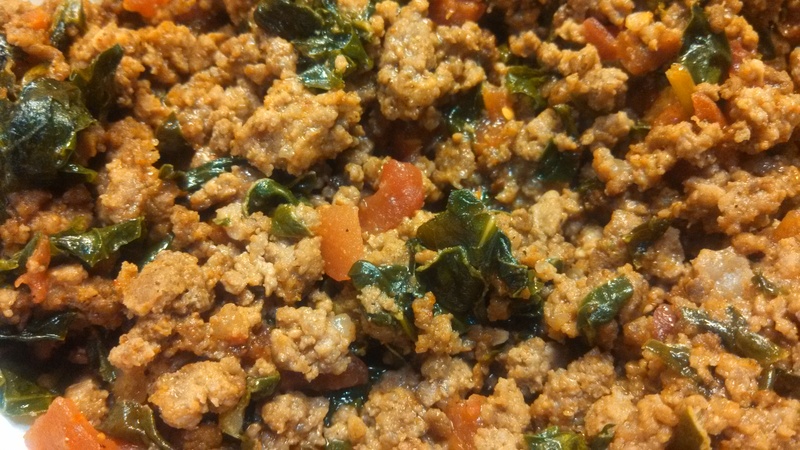 My sister says it’s all in my head, but I swear this ground beef tastes better than any ground beef I’ve ever had. Anyway, since I bought so much, I have been having ground beef as a breakfast or snack staple. Specifically, I love this recipe. I’ve been making it for weeks and it’s fantastic. This week I made some guacamole to go along with it. I look forward to it every day! A side note: I have a couple of weird food intolerances going on. One is eggs, which isn’t an issue with this recipe. The other is peppers. Any kind of peppers: sweet, hot, chilis, etc. But only if they’re fresh or canned. Dry doesn’t bother me (I assume it’s either that the pepper’s so processed, or because you use such a small amount). Anyway, I’ve been find with adding chipotle pepper, chili powder, smoked paprika and even Sriracha to stuff. I do it as minimally as I can stand, but if I eat even a little bit of fresh or canned peppers, my face breaks out, and I hate to think what’s going on inside my body. So keep that in mind with these two recipes. Both would be better with fresh peppers. Also, due to my allergy, I drain my tomatoes with green chilis and pick out the chilis. It’s a lot of work. I don’t doubt this recipe would be just as good with the chilis in it, but I’ve been eating it without. 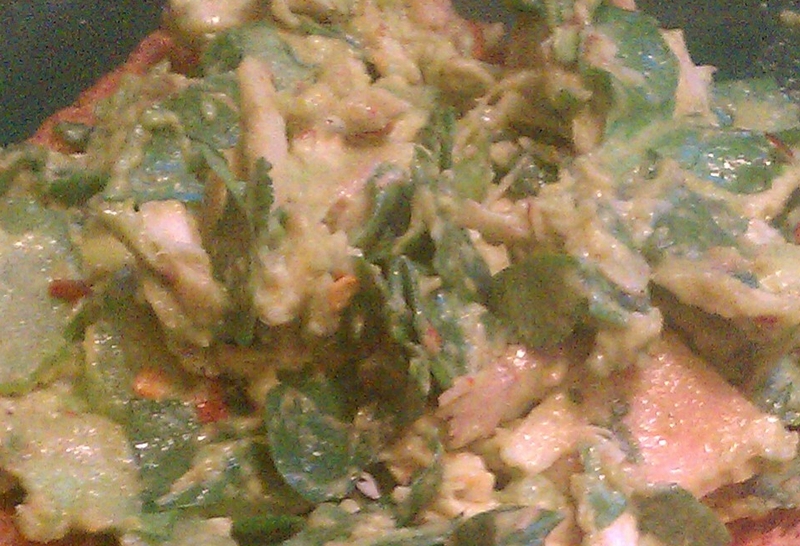 I originally found this recipe on Pinterest, and it was originally an egg, avocado and spinach salad. However, I have recently discovered (or maybe even developed) a sensitivity to eggs. Weird, right? All these years, and suddenly I can’t eat eggs without my face breaking out like a teenager. Well, we can’t have that, so I redid this recipe using chicken instead of eggs. I also added some additional spices to the mix, which are also delcious with the egg salad (I did try the egg salad, prior to my knowledge of said sensitivity).